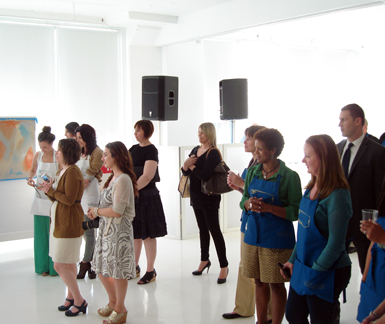 belle maison: New York (Part I): Lowe's Color Event with Nate Berkus! 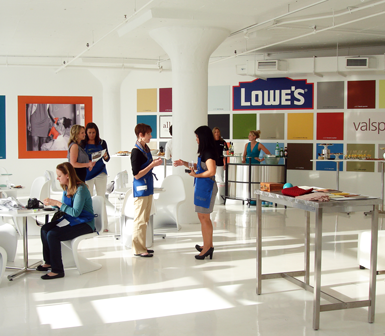 New York (Part I): Lowe's Color Event with Nate Berkus! 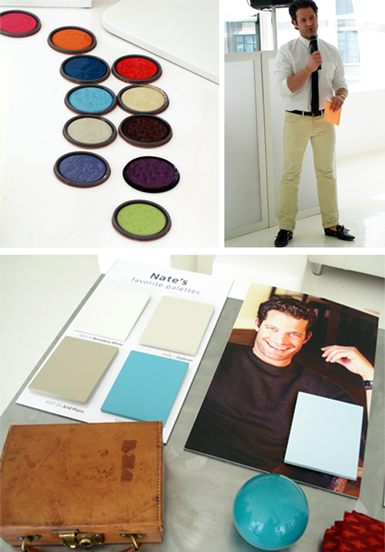 Nate spoke to us about his passion for color and how much he enjoys using it in his design projects. But like many of us, he used to refrain from using color in his earlier years as a designer because he was afraid of it. Three things that inspired him to introduce color into his projects, which he still looks to today, are nature, fashion and travel. The image directly above shows how Nate has created some of his favorite palettes by looking to objects such as a vintage suitcase, colorful scarf from India, etc. 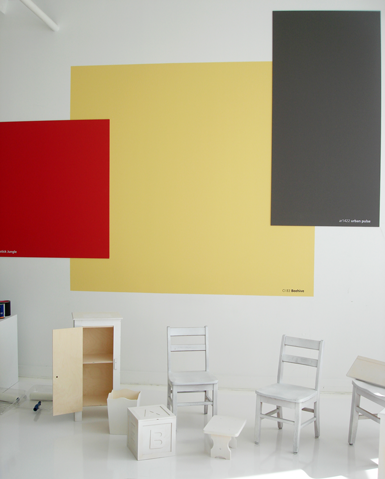 Where so you find your color inspiration? 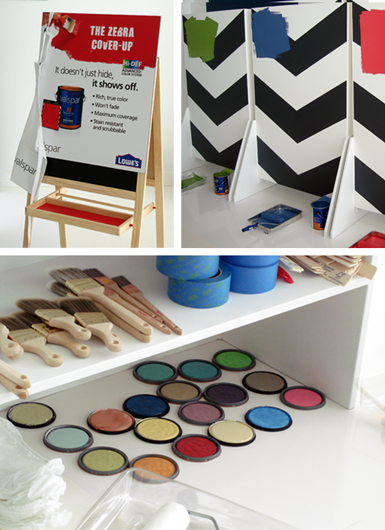 Paint cans, brushes and supplies were neatly displayed and we were encouraged to pick up a brush and try out different colors on blank canvases. Valspar's fabulous Hi-DEF Advanced Color System paint can cover up even the darkest of colors (even black, as seen in the top right photo), without using primer and in most cases, just one coat of paint. If I can eliminate priming a wall + two coats of paint, sign me up! Click here to see an example of how it works. A stylish little meeting area. 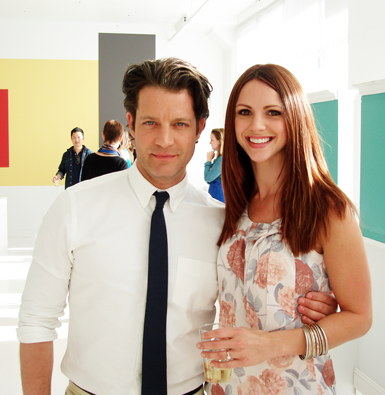 Nate Berkus was everything I expected him to be: down-to-earth, friendly and approachable...oh, and super good-looking! I asked him how he eases clients who are"afraid of color" into trusting him to incorporate it into their homes. He said a great place to start is by adding pops of color with accent pillows, or maybe a chair upholstered in a colorful fabric...small doses still offer interest and energy to a space without overwhelming the client with color. If you read my blog, you know how much I love color and how I'm always trying to encourage people to just "go for it"! Sweet and tasty treats for us to nosh on. 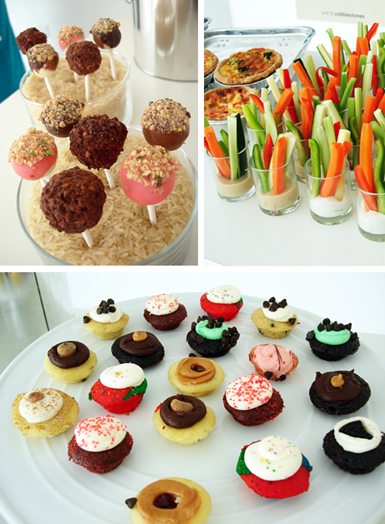 My favorite were the mini cupcake bites - so adorable! 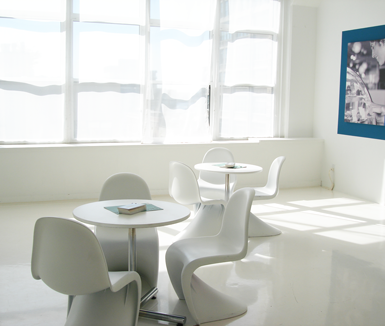 One area of the studio had a collection of all white furniture and accent pieces, which we later had the opportunity to paint in a competition. Nate jumped in on the action and got to work on a little side table. 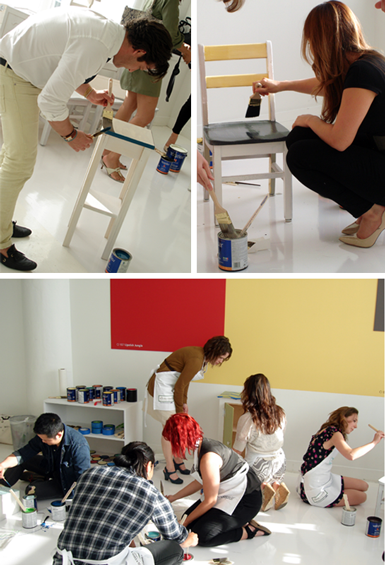 Top right is Crystal Gentilello from Rue Magazine, painting a small chair with her team. It was fun to watch everyone hurry to complete their painted pieces in just 30 mins. After a wonderful and inspiring afternoon of events, several of us met for cocktails at Plunge Bar, which is on the top floor of the Gansevoort Hotel. Great drinks and the most incredible views of the city! 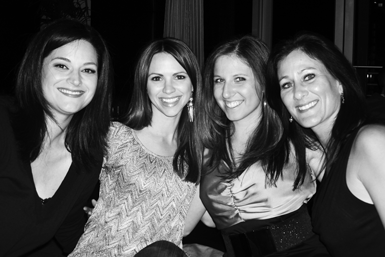 From left, Lea McIntosh of Nesting Newbies, Me, and two of the fabulous women from Lowe's marketing and PR who helped coordinate this fantastic event. I had such an incredible time and am grateful to have been a part of such a special experience. A big thanks to Lowe's and Valspar paint for making this happen! I'll be posting Part II of my trip tomorrow, which will cover the great food, shopping and sightseeing my husband and I squeezed in in our 2 1/2-day trip! It seems like a great event and the food looks yummy. 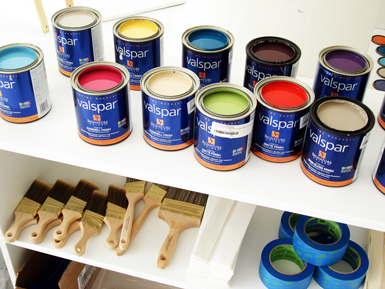 I love the vibrance of the colors in those Valspar cans. I would love to meet Nate one day, he does seem like great guy and I love his designs. Looks like a fabulous event...love all the details! You and Nate look great! Isn't he so delicious? Those eyes are amazing! BTW, will you be at blogfest?